I am all about easy meals in my house! This meal is a favorite because it whips up super quick! My husband does not like celery in the least bit, which is hard for me because most chicken salad recipes call for celery. I LOVE Chicken Salad so I was determined to find a recipe not calling for celery that we all liked and still had the good “crunch” from typical chicken salads. I found it… and it is now a favorite! It is perfect for picky eaters (like my husband :) )! A fast, easy and delicious meal! 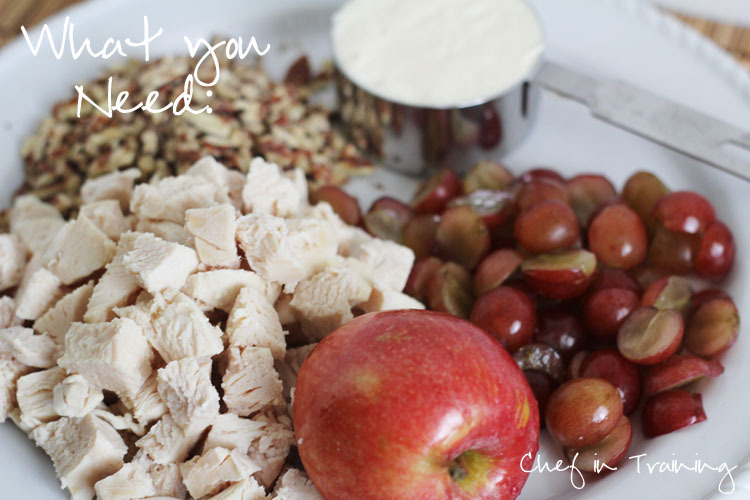 In a medium bowl, mix together mayonnaise, chopped pecans, grapes, chicken and apple. 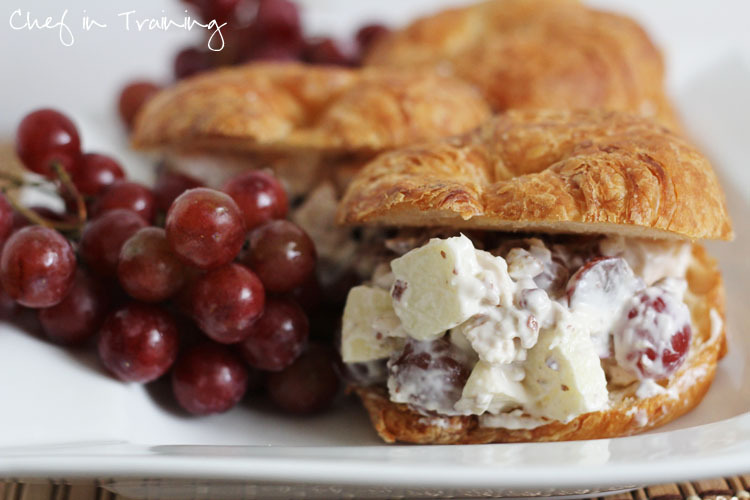 Serve on crescents, rolls, or sandwich bread. 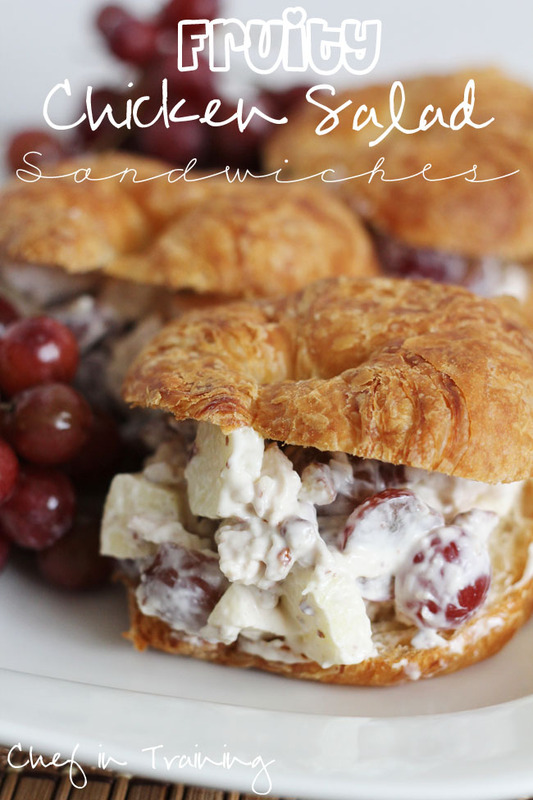 This looks great and would make a wonderful sandwhich to serve and a baby shower. Thanks! Hi! We all know mayonnaise is yummy yet high in hidden calories. What would you suggest as an alternative susbitute to mayonnaise for this recipe above? Thanks for the input. I wonder if you could use greek yogurt instead of the mayo? Thank you for this recipe! My boys have started archery practice one night a week away from home. I made this today & took it with us to practice. We assembled sandwiches in the parking lot after practice. It was a HUGE hit with everyone. They requested it again! Loved the crunch of the apples, we don't like celery here either! I use reduced mayo with cracked pepper, always use walnuts and a jazz or honeycrisp apple for mine. Alternative to mayo is a little greek yogurt too. I like to add my salad on a reduced carb pita bread with sprouts / mixed greens. I also add dry cranberries and honey. You should try it!! I am going to make this for a bridal shower for 30 people. How many sandwiches does your recipe make? I need to know how much to increase it by. It sounds delish, thanks! I've made these a few times now. Once for a baby shower. So yummy! I went to a brunch where this chicken salad was served without the bread and in a big scoup on top of a slice of ripe watermelon. Rolls were served on the side. It was so delicious that I went home and made it for the next week so my husband and son could taste it. They loved it, too, and it was great for a summer meal. If you absolutely don't want to heat your kitchen up cooking the chicken, use the supermarket cooked chicken instead. Does anyone know how many servings this recipe makes? ?